With the arrival of cooler weather, some of you may be experiencing what I am feeling every morning. The warmth of cosy bedding in a dark room vs. a colder room and a long list of things to do each day. Sadly, the cosy bedding never wins in this scenario. What’s a person to do? Well, I’m giving away something you can use on those hard-to-get-started mornings. I’m guessing you prefer to start your day the same way Mr. CARO and I do, with a warm mug in your hand. Do you have a mix of warm beverage fans in your home? Our home is quite divided over this issue. 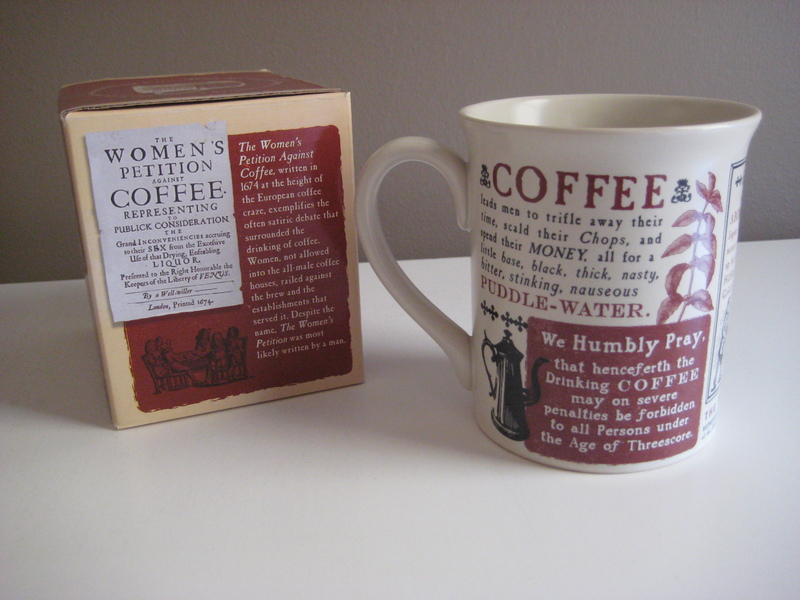 In fact, when I found these mugs and was in line to purchase them, Mr. CARO suggested I just get two of the pro-coffee mugs. But, no. I stood my ground and would not deny fair representation to my fellow tea-drinkers. 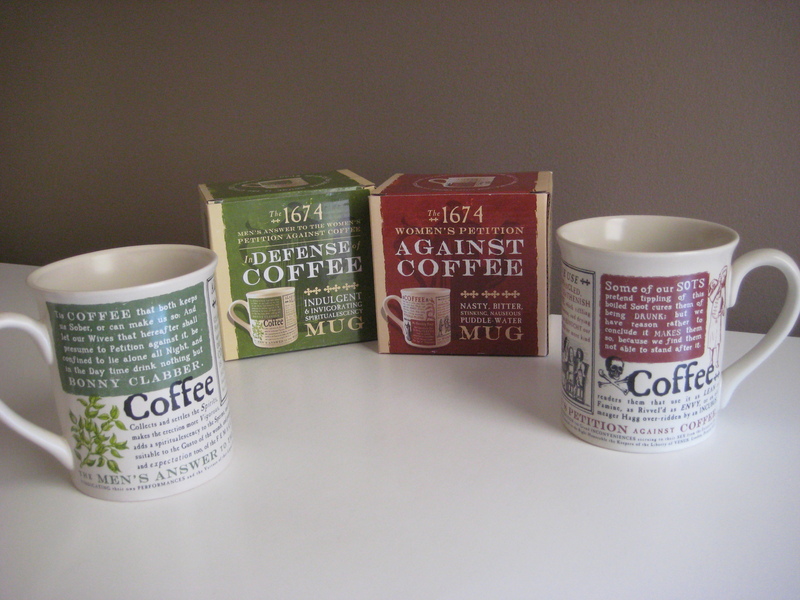 Could these mugs hold the line in the battle over caffeine sources in your home? Could you use a new coffee mug at work? 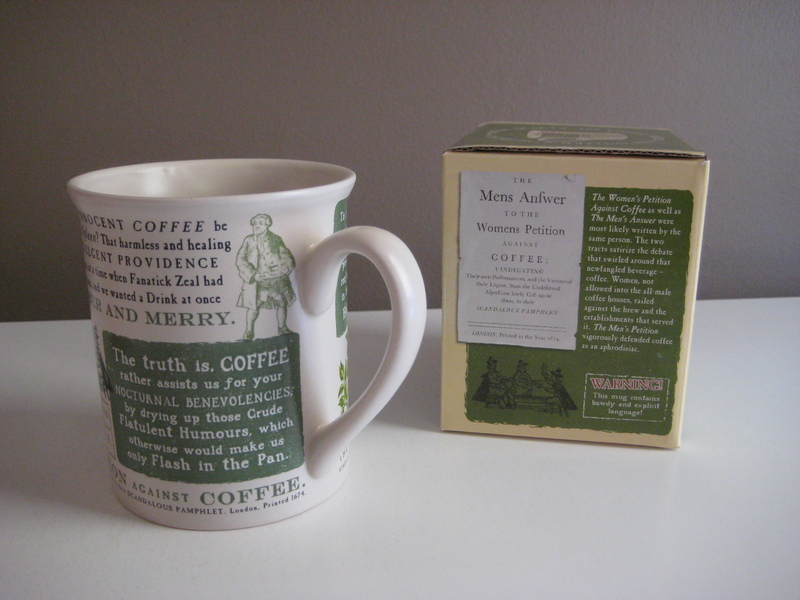 Need a Christmas gift for the tea connoisseur in your life? Could you serve up some delicious irony in your home by filling both mugs with rich hot chocolate? Why not find out? To Enter: Leave a comment that begins with “FILL ‘ER UP” and tell me what favorite warm beverage you prefer and how you like it prepared. Do you have to have coffee before you start your day? Do you crave a pick-me-up from a good cup of tea in the afternoon? Have you been known “supplement” your hot chocolate occasionally with “adult beverage” flavorings? Posted on October 6, 2011, in Giveaways. Bookmark the permalink. 12 Comments. FILL ‘ER UP I drink tea. I never really liked coffee, though occasionally I’ll splurge on a frappacino. Fill ‘er up. I love those mugs. I’d love to fill them with hot cider in the fall. 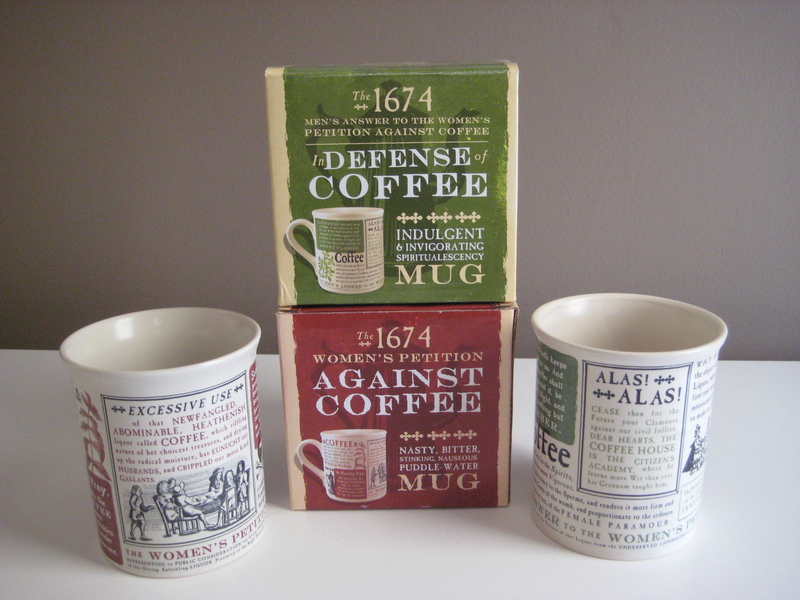 But otherwise, I will relish the “Defense of Coffee” mug. FILL ‘ER UP. I have a fondness for caramel mochas, but I can’t really make them at home. Hot, hot free trade coffee. The best I’ve found is donated by a family from church. Black. Fill ‘er up. Those cups are nerdtasticly awesome. I used to drink coffee and still do love it but have been incouraged strongly from the docs to give up the caffine. My infatuation had grown to such that I roasted my own coffee beans. Oh, coffee! How I miss you so! “Nerdtasticly awesome” is a great way to describe these mugs! Wow! I wouldn’t even know where to begin if I had to roast my own coffee beans. That is some dedication! Have you ever tried white teas? They often have great flavors but have minimal amounts of caffeine. I learned to love them on a business trip overseas but they are popping up more and more over here now. I believe even Lipton makes a few nice varieties. FILL ‘ER UP! As typical as it may sound…nothing is more warming and satisfying…year round, then my morning, afternoon, and after dinner cup of coffee. Beyond just a drink, its a quick treat throughout the day. Maybe I should invest in an espresso maker for my home to change it up from time to time! FILL ‘ER UP! I love to start my day with a lovely warm cup of green tea and I add a little Truvia to my tea as well! FILL ‘ER UP! I don’t drink a lot of coffee but these mugs are great way to start a day with some fresh peppermint tea added to them, get’s your day started perfectly. FILL ‘ER UP! Every morning I drink a hot chocolate with milk, then for evening either a warm milk if I want to sleep early or coffee if I have to stay late. I like my coffee sweet. Sometimes I add chocolates or milk with it too.